Elaine Watts – a Summerland super-talented artist, requested the recipe for the squash soup for which I had posted a picture on Facebook. I didn’t actually have a recipe as I make up soups as I go along, but the following will serve as a guide in the making of this delicious soup – all ingredients are local except the chicken stock and even that can be as well. 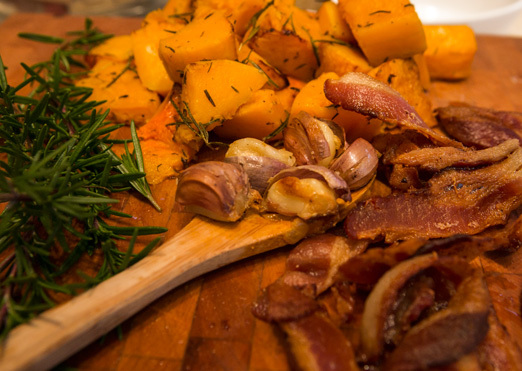 Roast some garlic, (in its skin but cut at both ends so you can easily remove the skin after roasting), squash, (butternut is a favourite), with rosemary, at around 350 or 400 in the oven until squash is easily pierced with a fork. I always roast about three times what I need and then chuck the rest in the freezer so I can make more whenever I like. Next fry some bacon in a frying pan. Cut up an onion and brown it in butter. Then in a large saucepan make a small amount of roux with a whisk using butter and flour and a bit of chicken stock. Stir this well until it thickens adding a bit of flour at a time if necessary. Then build up the soup base with more stock until you have a few inches of stock in the pan. At this point the soup should be starting to look like a soup. However, until you add your first big glug of local white wine, it is not really complete. So add a good extra glug, then drink some and add what’s left from that. (Kidding… sort of). Mel at Blossom Fruit Stand suggested adding pear to a squash soup. Good advice – it really makes a difference. For this particular batch, I couldn’t remember if she said to fry it first, so I just chucked it in uncooked but later remembered that the last time I made it, I had fried the pear in the bacon drippings. Oh boy – that was good. It’s possible any chef reading this would cringe and say I had violated many rules of cooking but to me if it tastes good, which it most certainly will if you’ve added lots of butter, lots of white wine and a lovely mixture of savoury herbs, i.e garlic and rosemary, then you will likely end up with something really special no matter how lumpy the roux may have started out etc. Just let it simmer on the stove once you’ve done the hard work, and then it will all meld together and be glorious. Especially if you have been baking focaccia in the oven while making the soup – pull from the oven, dip it in your favourite olive oil, followed by a dunk in balsamic vinegar (the good kind) – and you will think you’ve died and gone to heaven. If something messes up while making this ‘recipe’, don’t blame me – it’s all that white wine.